Elliot finally caught up to us. It took being confronted with his father’s grave, but at long last, the circle is closed. And he is not pleased. He fixes us with an icy, trembling stare, and says (with just the faintest tinge of bitterness), “You knew all along, didn’t you?” Which isn’t entirely true, at least not for most of us. It was a couple of episodes in before we really started to realize just what Mr. 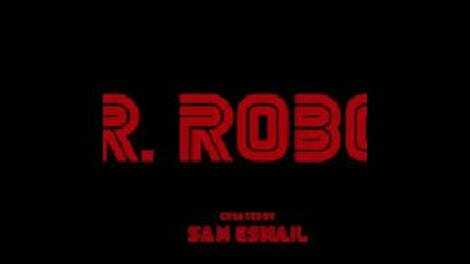 Robot might be, and we never knew as much as Elliot thinks we did. Indeed, if there’s one thing Mr. Robot definitively confirmed last week, it’s that none of us know as much as we think. Elliot, of all people, should start to realize this. Especially now that he’s been forced to say it: He is Mr. Robot. “M1rr0r1ng” was downright playful at times, even while dealing with the heaviest of subject matter and most significant of plot machinations. Yes, that was a cover of The Pixies’ “Where Is My Mind?” playing in FSociety’s Coney Island arcade at the end, a none-too-subtle tweak at those who have been insistently calling out the show’s debt to Fight Club. But Tyrell Wellick is no Marla Singer, and Elliot Alderson isn’t the lucid narrator of Chuck Palahniuk’s pitch-black satire. These strange bedfellows would probably like nothing more than to wipe one another off the face of the Earth. (Tyrell, for one, came prepared to do just that, had the need arisen.) But Wellick’s already been wiped off the world that mattered most to him—Evil Corp. And Elliot, as we saw last week, doesn’t even have an identity. So far as the online realm is concerned, he already doesn’t exist. Once again, the women of Mr. Robot prove themselves to be the humanist soul of the show, even as they start to question their most fundamental narratives, too. (Narrative is a tricky beast, as Angela, following the online news of Terry Colby, can attest.) Darlene is sticking by her brother, trying to construct a narrative of the loyal sister. It’s apparently a new story for her, as Angela icily mentions that Darlene was never that close with Elliot when they were younger. In fact, she only just moved back to the city recently. Presumably, Elliot’s plan to create FSociety had a lot to do with that move, not that Angela knows anything about it. The distance between Elliot and Angela exists with Darlene and Angela, too, but with a warm word and an apology, they move past it. They’re two people who have chosen to allow each other in emotionally, if not conspiratorially. And that’s both the painful truth and seductive allure of our late-capitalist age. Corporations don’t care if you’re good or evil; they care if you’re smart. If you want to try and change the world, go for it, as long as profits rise in the long run. It’s why idealistic non-profits hire soulless PR flacks who never met a dirty trick they didn’t like—morality does not exist in this dojo of socio-political booms and busts. Hell, Evil Corp could invite Angela to sit on its board of directors and not concern itself in the slightest with fearing she might “try something.” Because the men at that company know they’re halfway to victory just by her saying yes. The crux of it comes down to whether she can prove their cynicism wrong. They think Angela is like them, that she wants the whole world. But I’m betting they’re wrong. Angela doesn’t want the whole world; she just wants their half. How do you solve a problem like Mr. Robot? The emotional through-line of this story worked almost flawlessly, not because we didn’t see the big reveal coming, but because we saw all too well what was coming, and we knew the consequences. From the moment “m1rr0r1ng” began its countdown to Elliot learning the truth—that Mr. Robot was in his head, that his father truly was dead, and he’d been talking to himself—that grief-stricken look on his face was just waiting to flood the screen, and we were powerless to stop it. This should be Rami Malek’s Emmy sizzle reel. The mirroring going on wasn’t just with Wellick and Elliot, or Mr. Robot and Elliot. It was the mirroring of Elliot’s physical journey to his mental one, the trip to his father’s grave lining up with the exploration into his past, forcing him to confront his guilt about betraying his father’s trust. Most crucial of all, we still don’t know our part in all of this. Usually, the moment in a puzzle where the pieces come together, and the mysteries begin to be revealed, is a letdown. But Mr. Robot has elegantly flipped the script. Here, these discoveries aren’t narrowing the story into one recognizable outcome, be it some traditional resolution or digestible television trope. (As I said last week, this series offers up conventional, expected story beats only to undermine them.) No, all this is doing is foregrounding the audience’s lack of access to anything we might normally be able to cling to for reassurance. Because, ultimately, we are the X factor. 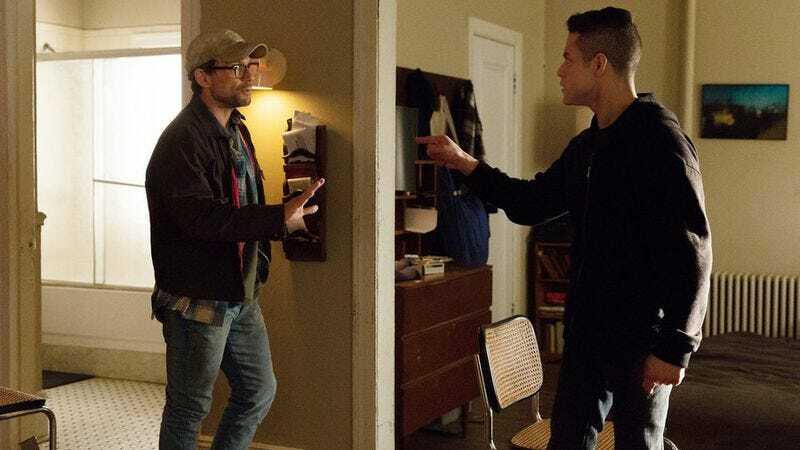 Multiple times tonight, characters—primarily Elliot and Mr. Robot—looked right into the camera, soliciting our culpability for their choices. We’re watching them, and listening to them. When Mr. Robot warns his son, “They’re going to get rid of me again,” he’s not just talking about Darlene and Angela, and the doctors and shrinks and pills. He’s talking about us. We let Elliot down by letting Mr. Robot go. We stopped seeing him, too. The total collapse of Tyrell Wellick’s life has been something to behold. Watching him reduced to his basest level, pleading with Phillip to let him keep his job, once again underscored just how essential his wife is to Tyrell’s sense of self. Truly, Lady MacBeth has nothing on Joanna Wellick. Poor Gideon. He’s the closest the show has to a good man, and he races around powerless, unable to stop events set in motion long before he came into the picture. Thankfully, his husband is there to excise his feelings of failure. “I don’t think failing looks like this.” In an episode filled with beautiful moments, that might have been my favorite. Come to Mr. Robot for all your 1995-era electronics needs. Angela’s a fan of early ’90s Sonic Youth—didn’t see that coming. I had her pegged as more of a Smiths fan. I’ll be mulling over this episode all week, on Twitter and in the comments, if you’d care to join me. There’s a lot to unpack before next week’s finale.